Home › Electronics › Hoont Powerful Electronic Rodent Trap - Clean And Humane Extermination Of Rat..
Hoont Powerful Electronic Rodent Trap - Clean And Humane Extermination Of Rat..
EASY TO USE Simply plug in the device with the provided adapter or insert batteries, apply a small amount of bait, such as peanut butter, etc., then place the HoontTM Electronic Rat Trap at the desired location and power it on. The Electronic Rat Trap will emit a 7000V shock when a rodent enters into the trap, instantly killing the rodent. New more powerful upgraded version. ADVANCED SMART DETECTION TECHNOLOGY The HoontTM Electronic Rat Trap is equipped with advanced rodent detection technology, which ensures that rats and all other rodents get instantly killed, without any possibility of escaping. Works for Mice, Rats, Squirrels, Chipmunks and other similar rodents. ULTRA HUMANE - The HoontTM Electronic Rat Trap kills the rodents as quickly and humanely as possible. It works by emitting a 7000V electric shock, which instantly kills the rodent, with virtually no pain to the rodent. PLUG-IN or BATTERIES - The HoontTM Electronic Rat Trap comes with a 5 Ft. plug-in adapter for hassle free unlimited kills. Can also be operated with 4 D batteries (batteries not included), allowing up to 30+ kills per set of batteries. / Features also an extension plugin- indicator light for hard-to-reach areas, that enables to check for trapped rodents without the need to check the actual device. SAFE & NO MESS Get rodent free without the use of dangerous poisons and chemicals / Discarding the rodent is a breeze with absolutely no mess. No blood and no touching of dead rodents; to discard the exterminated rodent, simply pick up the device, slide the dead rodent into the trash bin and place the trap back to its location ready for its next catch. / Dimensions: 11 x 4.5 x 5 / Upgraded parts for enhanced performance. Hoont Electronic Rodent Trap - Clean and Humane Extermination of Rats, Miceand Squirrels EASY TO USE– Simply plug in the device with the provided adapteror insert batteries, apply a small amount of bait, such as peanut butter,etc., then place the Hoont™ Electronic Rat Trap at the desired location andpower it on. The Electronic Rat Trap will emit a 7000V shock when a rodententers into the trap, instantly killing the rodent. The indicator light willflash indicating a rat has been exterminated and needs to be discarded.Perfect for homes, warehouses, factories, commercial kitchens, etc. 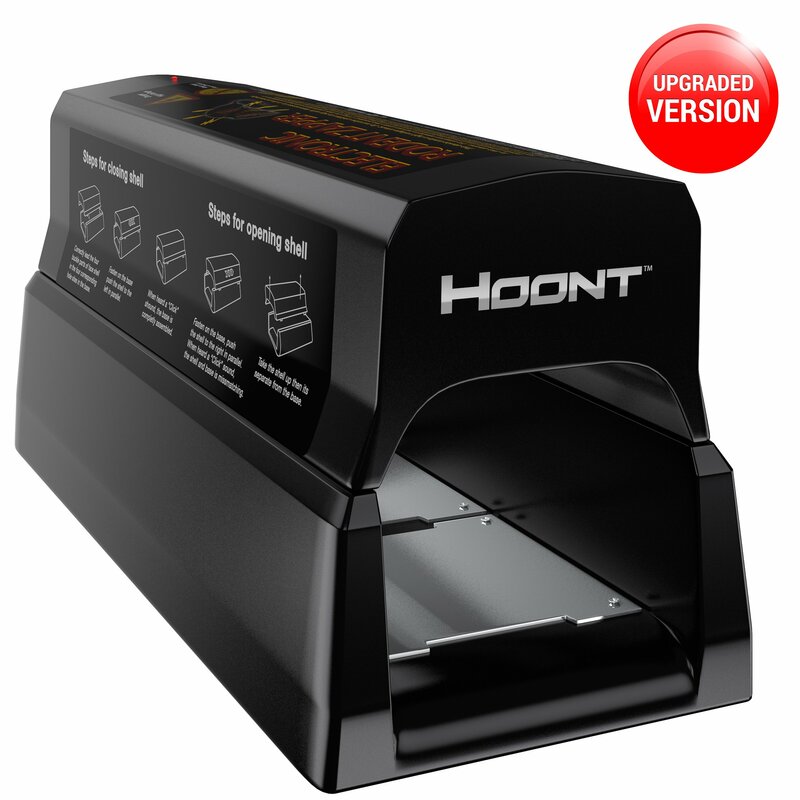 ADVANCEDSMART DETECTION TECHNOLOGY – The Hoont™ Electronic Rat Trap is equipped withadvanced rodent detection technology, which ensures that rats and all otherrodents get instantly killed, without any possibility of escaping. Works forMice, Rats, Squirrels, Chipmunks and other similar rodents. ULTRA HUMANE - TheHoont™ Electronic Rat Trap kills the rodents as quickly and humanely aspossible. It works by emitting a 7000V electric shock, which instantly killsthe rodent, with virtually no pain to the rodent. PLUG-IN or BATTERIES - TheHoont™ Electronic Rat Trap comes with a 5 Ft. plug-in adapter for hassle freeunlimited kills. Can also be operated with 4 ‘D’ batteries (batteries notincluded), allowing up to 30+ kills per set of batteries. / Features also anextension plugin- indicator light for hard-to-reach areas, that enables tocheck for trapped rodents without the need to check the actual device.